First published on September 14, 2016. This is my list so far. I will try to follow this list as I research. The next few posts will be about the information that I have now. Hopefully I can get closer to Jehial’s origin story. First published on September 10, 2016. I’m back to posting, hopefully regularly. This seems kind of counterintuitive but recently I’ve taken on a lot more responsibilities outside of work. Self care is really important to me, especially with the work that I do, and working on my ancestry is part of my self care. So I’m going to try to keep doing work on my trees and posting as regular as possible. To help with this, I’ve decided to focus my research and thus my posts on one person for now. This is Jehial Stanton. I’ve mentioned him in other posts, and I have a picture of him but I don’t know who his parents are. I’ll post my check list for my research soon and then my research as a get into it. I’m also going to research how he got from New York to Iowa/Illinois, I have other ancestors who went from Connecticut to Iowa at the same time as well. I was talking about his story to a friend recently and she asked how he got to Iowa and I didn’t have that answer. I don’t know what I assumed. I think I was always imagining a Grapes of Wrath sort of scenario with all of the furniture plus grandma on top in the back of an old truck, but obviously in 1850 that would not be possible. She wondered if they had gone in a covered wagon akin to the Oregon Trail and that was something I never considered. So I’m also going to look into what that journey would have been like. Like I said, I am going to try to keep up and keep researching. First published on May 28, 2016. I haven’t posted in awhile and I’m sorry. The truth is, I kind of got burnt out doing my research (Warning for the post, it may be a little sad and existential). I can dig and dig and dig through records to find a birth date or how many times someone was married but I’ll never really know who they really were. I won’t know what made them happy, how they acted, if they liked to bake or ride horses or read. Life now is drastically different than it was 100 years ago and somethings I will never understand. Yes, somethings are the same, but most of them aren’t. The social codes that we operate by today are different than they were even 25 years ago. I wish that my five year old self could have asked my great grandmother what her parents were like. As much as records get me, I definitely yearn for more information, and not the kind that you can get from a census. Now we have so many ways to express ourselves. My ancestors have only to look at my Facebook or this blog to know what I was really like, and not be left the bare bones of my life. I know that this information might be out there, but it’s probably not. It makes it more important for me to interview my family, to see what they can remember about their parents or great grandparents, to find out more about their personalities. I’ve got some interviews with my grandpa and my great-uncle so I’ll listen to those and see what I can drum up. I work in a nursing home, dementia and memory loss are something that I encounter multiple times per day. Reminiscence is something that I try to encourage everyday at work, and I can see the light that it brings to people’s eyes when they recount a fun story about their loved ones, little quirks they may have had, trips from their childhood. It’s made me realize that the past is important. You can get stuck there, and that’s never good. But it’s important, at least for me, to know where I come from. It’s a major part of me whether or not I acknowledge it. I wouldn’t be here if it weren’t for all these thousands of people who lived their lives. I wonder if my ancestors would like me, or if I would like them. Thanks to all of my family, I live a great life. I have the Internet, I can spend time researching my family, and I don’t have to toil anywhere. I have access to health care and as a woman, I was able to get a graduate degree. Certainly things that it would have been hard for my grandmother to do. I think this is where my fear of disconnection comes from. I’m a different woman that I would have been had I been born in 1890 instead of 1990. Would my ancestors be able to understand my life and would I be able to understand theirs? That’s why I want to know their personalities, because that’s something that everyone has had and will have and I think that it is the easiest way to understand them at least from my perspective. I know that this post is angsty, I’m trying to explain why sometimes digging into my ancestors burns me out. I still love to do it, and it always makes me excited. I can spend hours trying to find something and I can block out everything to the point where if my partner asks me a question, I’ll get startled. I’m going to try to organize my research, finish working on the pictures that I have and try to interview more of my family. It might be awhile yet until I post again, but I haven’t given up on discovering my origin stories. First published on February 5, 2016. Sorry! I haven’t posted for awhile. I was starting a new tree, and got kind of sucked into that. It’s nice to start new trees on ancestry.com because I can avoid the mistakes I made with my first trees. The biggest mistake I’ve encountered when making my trees is importing information from other trees. Sure this information might be correct but there’s no telling where that information came from. What I do now is check each tree that has been “hinted” to me, to see what sources they got their information from. Maybe this isn’t important to everyone, but I like to have an original source for all of my ancestry “data”. Here’s an example: James Kelly, my fifth-great-grandfather was born some time (give or take 10 years) around 1760. I don’t know his actual birth year but there is a American Genealogical-Biographical Index (AGBI) record for a James Kelly born in Massachusetts in 1760. The AGBI is a huge data base of genealogical information from genealogy records and family histories. On ancestry, this just shows as an index only record. The problem with this record is that I’m sure there was more than one James Kelly born in the state of Massachusetts in 1760. Furthermore, I can’t collaborate this information with any James Kelly in the Massachusetts Vital Records. That doesn’t mean that this James Kelly didn’t exist, it means that I can’t find any cross references to his birth or any information to narrow down his birthplace to a specific town. Since I couldn’t find a record of a James Kelly born in this time frame, I also knew I was going to have a hard time finding out who his parents were. But when I looked at the other trees that had my James Kelly, his parents were listed as George and Margit Kelly. Now George and Margit Kelly lived in about the same area where it would make sense that James was born and they had children that were listed in the Massachusetts Vital Records but as I said earlier James does not show up in those records. Again this doesn’t mean that James was never born but it could mean that they lived in another town when James was born and those records were lost. However I can’t verify that they were his parents through the Vital Records, and when I went to go check to see what source that this information came from, I found that it came from another tree, and then another tree and then another tree. That’s a problem I have with ancestry.com is that it is so easy to import other trees, but what ends up happening is that mistakes get compounded upon. 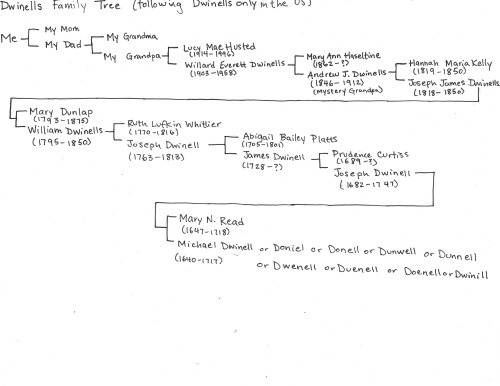 I’m not saying that this is a mistake but even through searching archives.org, I found no genealogy that would back up this claim, so I have no idea where the information comes from. So I guess, the moral of this post is be careful if you use ancestry.com. Make sure you check the sources of your information, and if you are going to import another tree into yours, maybe jot down some of the information first and see if you can quickly verify it, or check the sources and records of the other trees. First published on October 12, 2015. I am back from my Columbus Day Weekend trip and I have tons of new (old) photos and documents to go through, maybe more than my great-grandmother’s box. However, preliminarily these photos seem to have more names on them than the others. This collection also belonged to my great-grandmother, and was in another family member’s house. I don’t want to go too crazy scanning and preserving these photos all at once, so I’m going to take my time. I also need to try to investigate the photos that I already had. My new plan is to have two new posts a week, one will be a photo investigation and the other will be an ancestor profile. I’ll also throw in a few updates or short little posts from time to time. Hopefully through this approach, I can post more consistently.